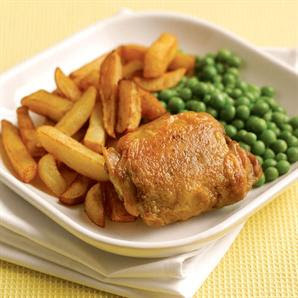 Chicken Chips and Peas is a very old favorite of mine. It was born by my English Grandma who used to give us this meal for lunch once a week after school! I modified this recipe a bit to conform to my new health regime and yet I have to say it was still very similar to Grandmas lunch. two large leg and thighs. Mild extra virgin olive oil. (Here's the healthy bit..no deep frying!!) Olive oil is actually GOOD for you. If using frozen chicken, first of all defrost thoroughly your chicken leg and thighs. It is best to do this overnight in the fridge. Start the meal by getting the meat going. Dash a little of the olive oil into a large pan which has a lid. Season with the ground pepper and rub the minced or chopped garlic over the meat. Start turning the heat up until the meat is just sizzling. It will probably be at about 25% of your dial. This is grandmas secret method. Very slow frying. Expect this to take an hour. 30 min on each side. Don't turn more than necessary. A certain amount of liquid will form, but leave the lid off long enough for it to steam off then resume with the lid on. This combination of frying/simmering in liquid is the key to truculently tender meat after about an hour. Whilst this is going on, lay your parboiled chips out in an oven dish and drizzle a little olive oil over them. Shake and coat as best you can. Put into the oven at 200C (390F) Once its sizzling gently toss again and turn individual chips carefully to coat with the olive oil. Let them brown lightly, tossing as required. AT THE SAME TIME!!! O' harassed cook, put your peas into a small saucepan with a lid and a teaspoon of REAL butter. Yup. our one exception to strictly healthy food. Baby peas without butter are just not worth eating in my opin! Again gentle heat until the butter melts and the peas steam cook for about 10 minutes. Serve with ice cold coke in the bottle with a straw! Mmm... this looks really inviting. A nice tasty dish. Impossible to refuse it! Thanks for always checking in! We eat it nearly every week. This reminds me of the food I used to eat when I was a child, and those chips look amazing!!! It kind of feels that you're doing any unique trick. Moreover, The contents are masterpiece. you've performed a wonderful process in this matter!